Explore the zoo like you've always wanted to! Get up close with the animals and the extraordinary work of the Bronx Zoo, or relax with a tour of must-see exhibits. Make someone’s day with an up-close animal experience! Purchase a Wild Encounter gift certificate today. Best of the best! 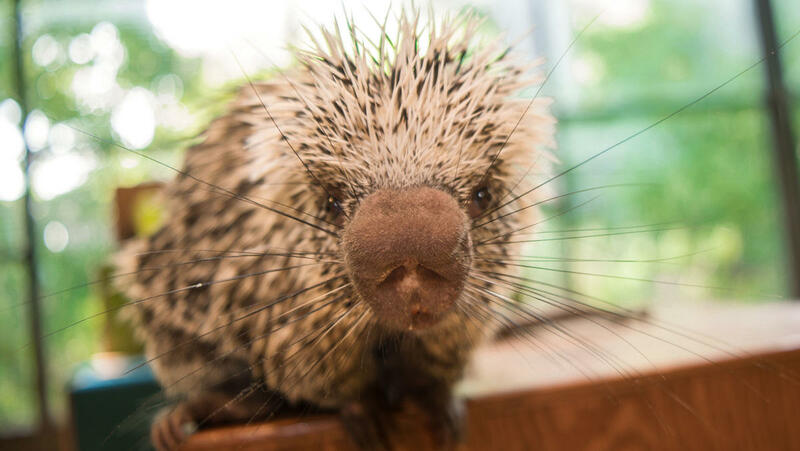 Enjoy a hosted cart tour and up-close encounters with amazing animals at our Wildlife Ambassador Center. Tour will highlight our award winning exhibits and host will be able to share their park knowledge along the way. All participants must be age 6 and over. Children age 17 and younger must be accompanied by a paid adult. We cannot guarantee which animals you will meet on an encounter. Selection is at the keeper’s discretion - and is always subject to change - but may include species such as porcupine, parrot, snake, alligator, owl, emu, and sloth. Many exhibit areas and views are not reachable by vehicle. Carts Tours include frequent stops and require walking throughout the experience. 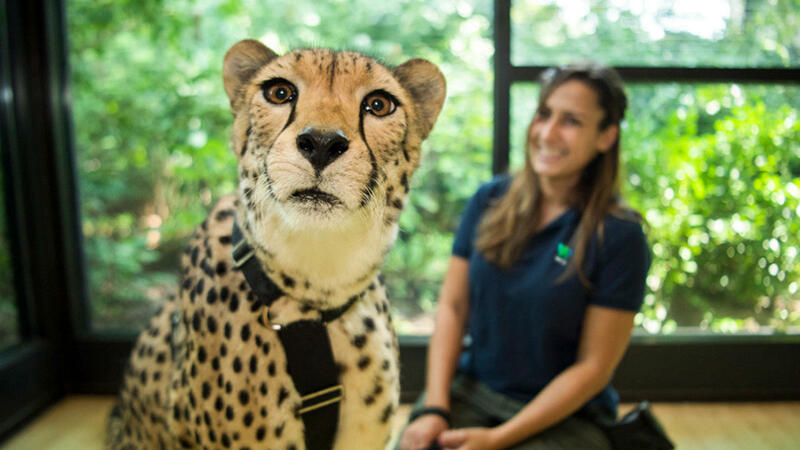 Visit with our ambassador cheetah, and canine companion, for an extraordinary meet-and-greet opportunity. Learn about our animals and how we care for them from the experts. All participants must be age 12 and over. Children age 17 and younger must be accompanied by a paid adult. Program length includes travel time to walk from check-in to encounter venue location. Handheld cameras permitted, but must be silent (no shutter sound), and no long lenses. Enjoy a hosted cart tour and the opportunity for an up-close meeting with one of our unique African wildlife species. We cannot guarantee which animal you will meet on this tour. Selection is at the keeper’s discretion and is always subject to change - but may include species such as giraffes or rhinos. Fans of our award-winning Animal Planet docu-series – here’s your chance to meet some of the animals you’ve fallen in love with! 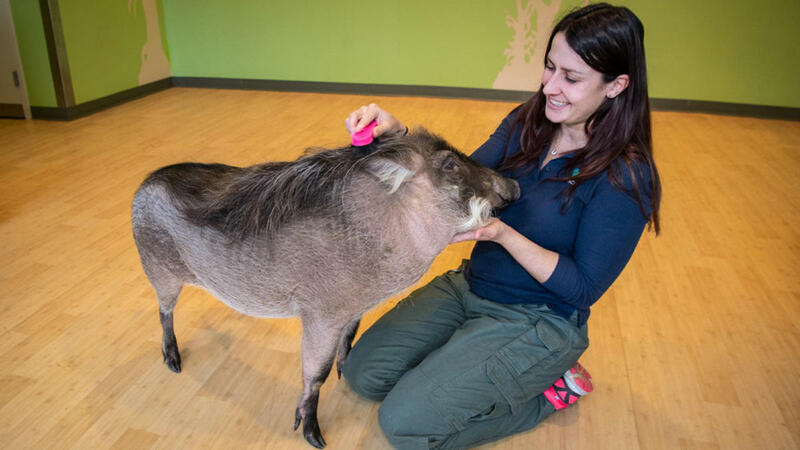 Meet two of our “celebrity” ambassador animals and talk with members of Kathleen’s keeper team. We cannot guarantee which animals you will meet during this encounter. Selection is at the keeper’s discretion and is always subject to change. Bring your flock to meet some of ours! 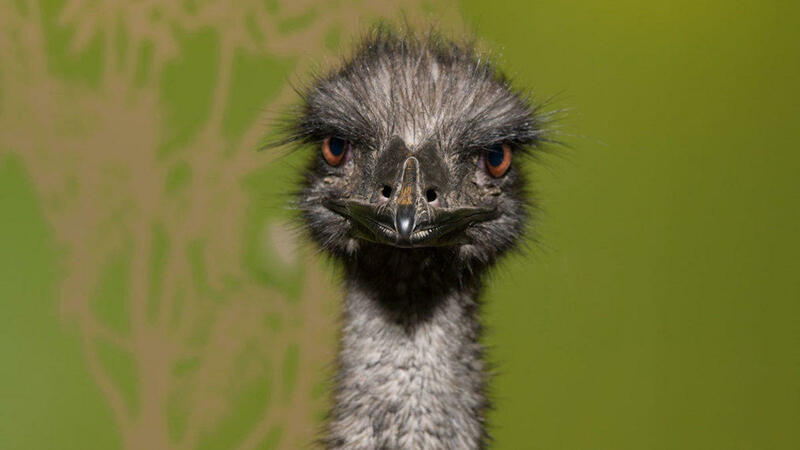 A special opportunity to see amazing birds up close and spend quality time with their keepers. Program length may run a little longer to allow for travel time to walk from check-in to exhibit or encounter venue. We cannot guarantee which animals you will meet on an encounter. Selection is at the keeper’s discretion - and is always subject to change - but may include species such as parrot, hornbill, whistling duck, emu, crow, owl. 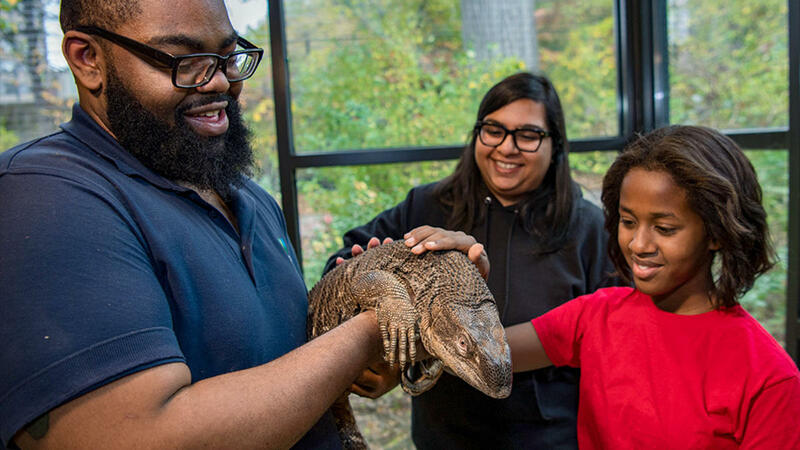 Scaly skin, shells and scutes - meet fascinating reptile species up close and spend quality time with their keepers. We cannot guarantee which specific animals you will meet on an encounter. Selection is at the keeper’s discretion, and is always subject to change. Waddle this way! After a stop to check in on the Little Penguins at our Aquatic Bird House, we’ll head to a private up-close meet and greet with our ambassador penguins. 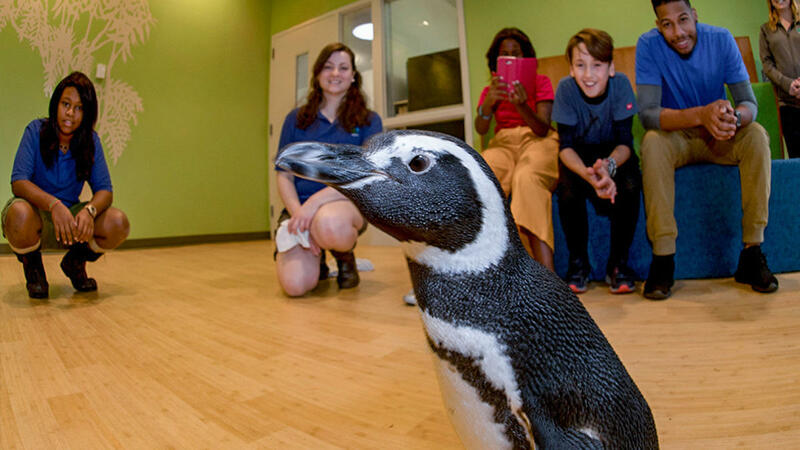 Meet our Magellanic penguins up close. Program length includes travel time to walk from check-in to exhibit and encounter venue. Slow down your day and come hang out with our Sloth. 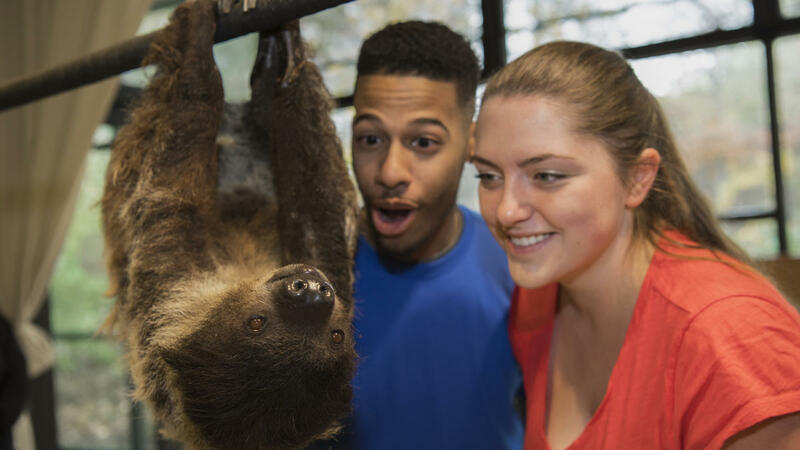 Our Two-toed sloth enjoys meeting new guests and just hanging out. All participants must be age 3 and over. Children age 17 and younger must be accompanied by a paid adult. We know foxes are fun! 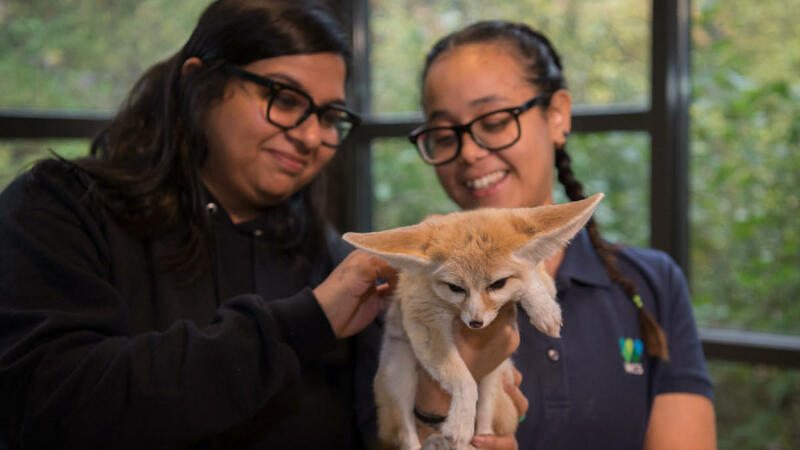 This small group encounter gives guests a chance to spend quality time with our keeper and see fennec fox activity and social interactions up close. Meet our foxes up close and see them firsthand. Interact with the foxes and ask our staff questions. Up close animal encounter AND I get to skip the ride line?! It’s true! 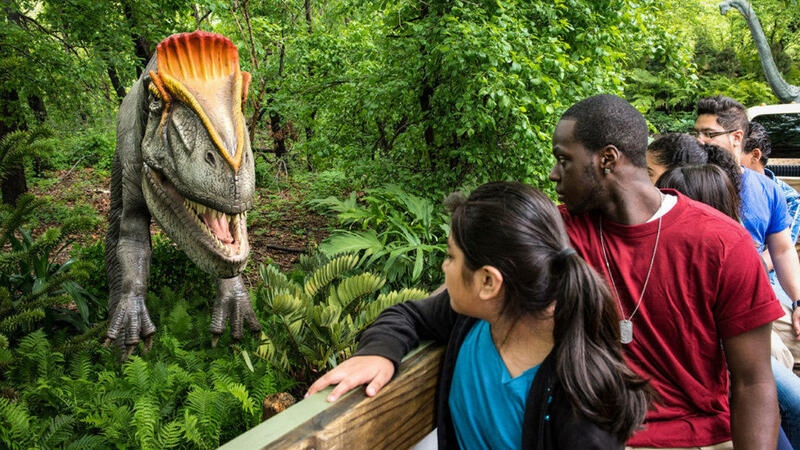 Your exclusive small group access to Dinosaur Safari includes VIP wagon loading, followed by an amazing animal experience. Program length includes travel times between check-in, ride, and encounter venue location. We will not stop at the Dino Field Site, but guests can be driven back to that area at the end of the program to explore on their own. This ticket is for the program ONLY and does not serve as admission into the zoo. Must have a valid WCS Membership or separate admission ticket (any type) in order to enter the Bronx Zoo. Tickets or Membership can be purchased in advance online, or upon arrival at zoo entrance. Check-In for all programs is at Zoo Center (10-15 prior to program start time). 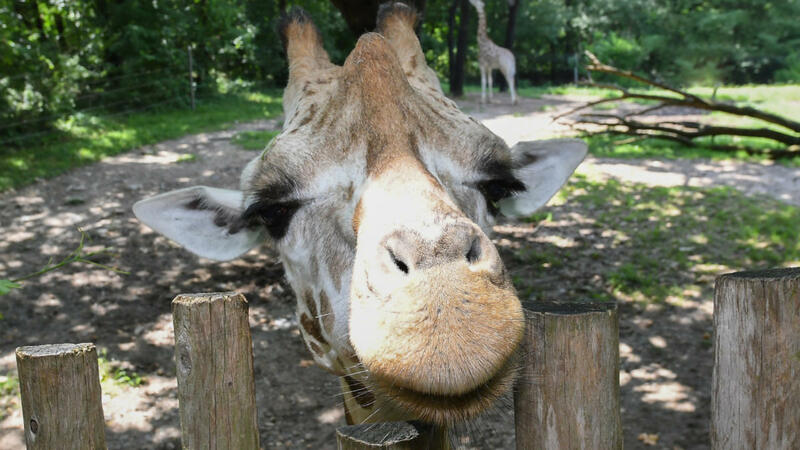 We recommend arriving to the zoo via Southern Boulevard Gate (the closest entrance to Zoo Center). Please be sure to plan enough time for travel, as programs will start on time and we are unable to accommodate or refund guests who arrive at check-in after program start time. Rain or Shine! Programs run in all weather. We recommend comfortable clothing and shoes for walking. Many exhibit areas and views are not reachable by vehicle, Cart Tours include frequent stops and require walking short distances throughout the experience. Cameras: no tripods; handheld devices are welcome. Flashes are not permitted to be used in some exhibits. For Cheetah Connection, all camera shutter sounds must be silent and no long lenses. Personal Items: Only bring what you will carry, as we do not have space for storage and the cart will be left unattended at times when the tour is inside exhibit areas. Strollers are not able to be loaded onto the tour cart and there are stroller restrictions at some exhibits. If bringing a personal stroller, we can store that at the Check In area during your tour. Wheelchairs: Many exhibit areas and views are not reachable by vehicle. Carts Tours include frequent stops and require walking short distances throughout the experience. If anyone in your party requires the use of a wheelchair during the tour, please call in advance: 347-308-9021. *Ticket is for program only and does not serve as admission to the zoo. Must have a valid WCS Membership or separate admission ticket in order to enter the Bronx Zoo.